Even those people who live with only the items they can carry had an initial purchase of the backpack and those items. Most items usually have to purchased somehow. Even though a lot of people barter and trade for things and claim they don't use the money, they don't realize that bartering and trading is a form of currency - just not actual money. One of the things I notice in a lot of these stories of living with no money is that people are usually taking advantage of other people's kindness and their willingness to either donate goods to or spend the money on that person. The person themselves may not be using any money and technically living without money, however, other people are spending their money on that person somehow. Many preppers have this idea that if and when WROL (without rule of law) happens, money as we know it will mean nothing. You will need gold and silver to pay for items or otherwise you will need to sharpen your bartering and trading skills. However, you will notice that some form of currency will still be needed or used in their line of thinking. While I don't disagree with them, without a standard unit of measurable value, gold and silver will not mean much either unless a value is attached to it. Without rule of law, who will attach a value to it? There is great potential for inflation in this problem which will cause people to live without as much as possible in order to not use any form of currency. Many preppers also have this idea that they can run to the woods, live off-grid, live off the land, and not need money at all. They also have an unrealistic view of how hard it is to survive like this. They claim that people did this hundreds of years ago and it can be done today. I would argue this. First of all, read your history. Many people who did live in the wild still traveled to the trading posts and local towns to do trading and purchase goods they needed to survive. Otherwise, traders and traveling salesmen stopped at their homes at least once a year to replace or purchase items needed. Very few people could make all the items they needed to survive. Items like clothing would need to be replaced which meant purchasing fabric and sewing items. They more than likely traded furs, produce, and crops for these items. However, some form of currency was happening. Second of all, most preppers do not have all the skills and physical stamina needed to live a life like that. The pioneers were a tough group of people who learned quickly to make do, make it themselves, or live without if it wasn't a necessity. We have gotten used to purchasing the items we need and do not know how to make a log cabin without using nails. Even in the 1800s, windows for cabins were purchased or traded for. Again, some form of currency was used. They did not live without money. So, as it stands, almost all people today cannot live without some form of currency. 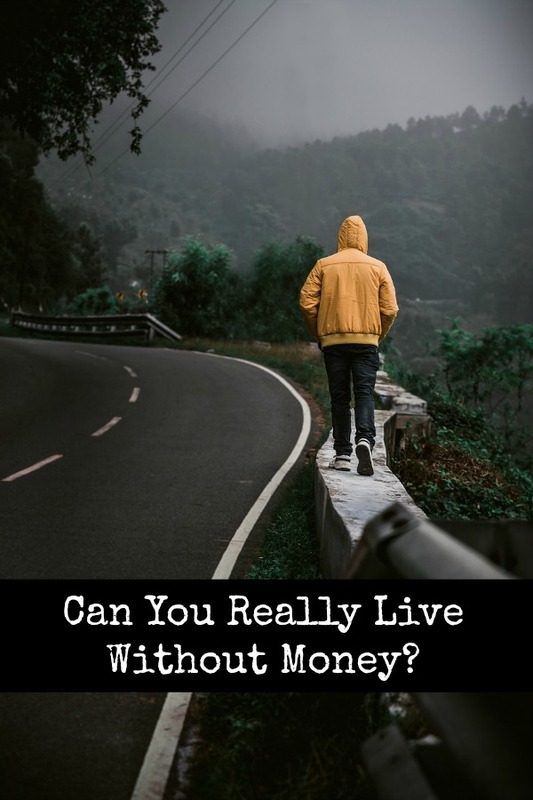 However, as much as I think we cannot live without it, I certainly think we can live with much less money than we do now. There are quite a few people in the world who make do for themselves - growing their own food, saving seeds for next year, sewing their own clothes, mending their things, and generally being self-reliant. They live and practice skills so they do not need as much money to live like the standard person. Some people are forced to live without a lot of money. They earn just enough to survive and that is it. Some people have more than they need. However, being wasteful with money can cause hard times in the future when they may not be earning it but still need it. As preppers, we want to purchase and procure all the things we may need in a crisis, but we need to be weary of what that crisis may be. We may need to put money away and live simply now in order to survive the crisis later. Let me know your thoughts on this in the comments. While I don't believe someone can truly live without money, you all might have some insight into this.